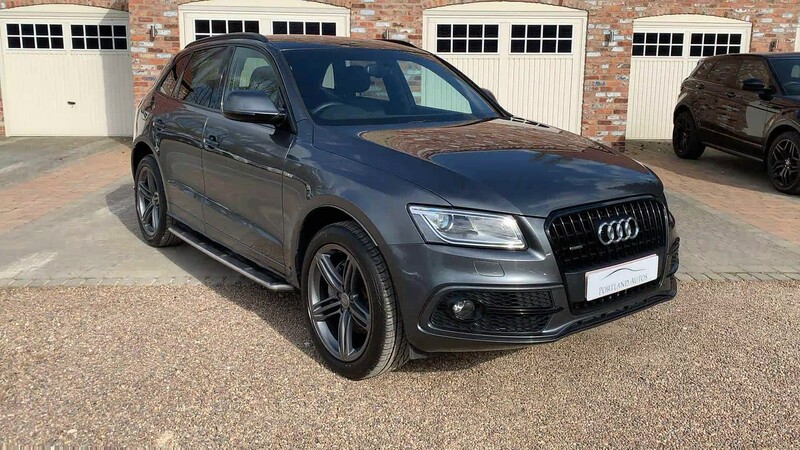 2015 15 AUDI Q5 3.0TDI QUATTRO AUTOMATIC S LINE PLUS IN DAYTONA GREY WITH BLACK LEATHER INTERIOR. THIS CAR IS JUST ONE PRIVATE OWNER FROM NEW AND COMES WITH A HUGE SPECIFICATION WHICH INCLUDES FACTORY FITTED REAR ENTERTAINMENT, FIXED SIDE STEPS, 20 INCH 5 DOUBLE SPOKE ALLOYS IN GREY, ELECTRIC ADJUSTABLE SEATS WITH DRIVER MEMORY, REVERSING ASSIST CAMERA, FRONT AND REAR PARKING SENSORS, HEATED FRONT SEATS, PRIVACY GLASS, BLACK ROOF RAILS, FLAT BOTTOM LEATHER MULTI FUNCTION STEERING WHEEL, HEATED AND ELECTRIC FOLDING EXTERIOR MIRRORS, MMI SATELITTE NAVIGATION, DAB DIGITAL RADIO, DUAL ZONE CLIMATE CONTROL, BLUETOOTH AUDIO STREAMING, CRUISE CONTROL, INTERIOR LIGHT PACK, AUDI HILL HOLD ASSIST. 2xKEYS, HPI CLEAR, FINANCE AVAILABLE, PART EXCHANGE WELCOME, TO VIEW UP TO 40 HD PHOTOS AND A HD VIDEO OF THIS VEHICLE PLEASE VISIT OUR WEBSITE.